When Emily feels well (and decides to wear her wig) – you’d have no idea she is even sick if she wasn’t using a crutch. We are so thankful for how God is carrying all of us through this. It has been exactly one month since our last update. 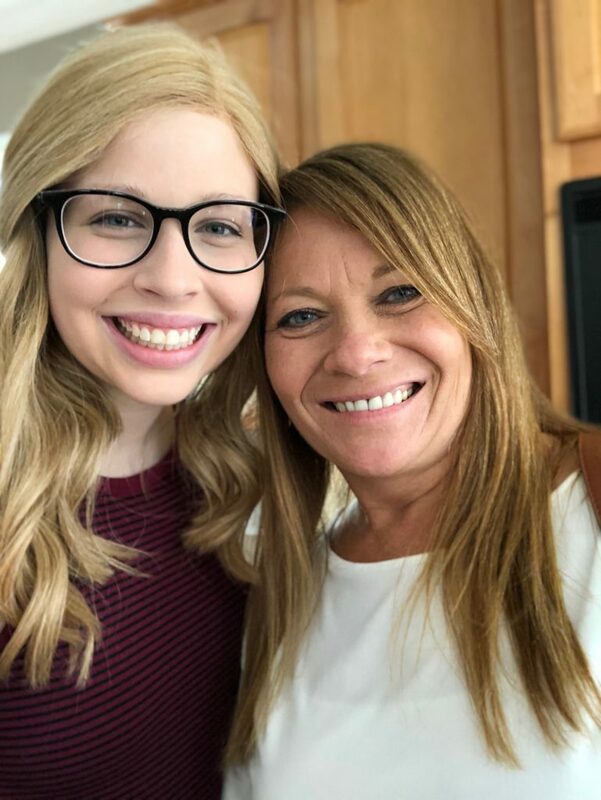 Here is the latest – if you are following Emily’s story. Emily now has 1 doxorubicin treatment and 5 more methotrexate treatments remaining. We are officially two-thirds of the way through chemo!! Many of you were praying that Emily would be well enough to go on the retreat. Sadly, she wasn’t able to go. Two days before the retreat she developed terrible mouth ulcers (one of the side effects of her chemo). The mouth sores were so large and bad that if she even smiled, one of the ulcers would break open on her lip and start bleeding, and because her platelets are low, her blood won’t clot very effectively and her lip would bleed for 20 or 30 minutes. She had to be admitted to the hospital to receive fluids because she couldn’t eat or drink. They also gave her morphine while in the hospital. She was very disappointed that she couldn’t attend, but we are trusting God had a reason. She had developed ulcers before but they were very manageable – even though painful and uncomfortable. But these ulcers were debilitating. To have that happen for the first time in 8 months of treatments seemed clear to me that God had a reason. Perhaps she will be able to go next year. To quote 2 Corinthians 4 – Emily is “hard pressed on every side, but not crushed; perplexed, but not in despair; … struck down, but not destroyed.” We remain hopeful. It was discouraging but she has moved on. Her mouth has mostly healed. The ulcers not only canceled her trip but further delayed her treatments. In the month since our last update, she has had only one more treatment – because of a scheduled 2-week break and then the ulcers. So that leaves us with six to go. 12 down and 6 to go! The ulcers put us about two more weeks behind schedule. 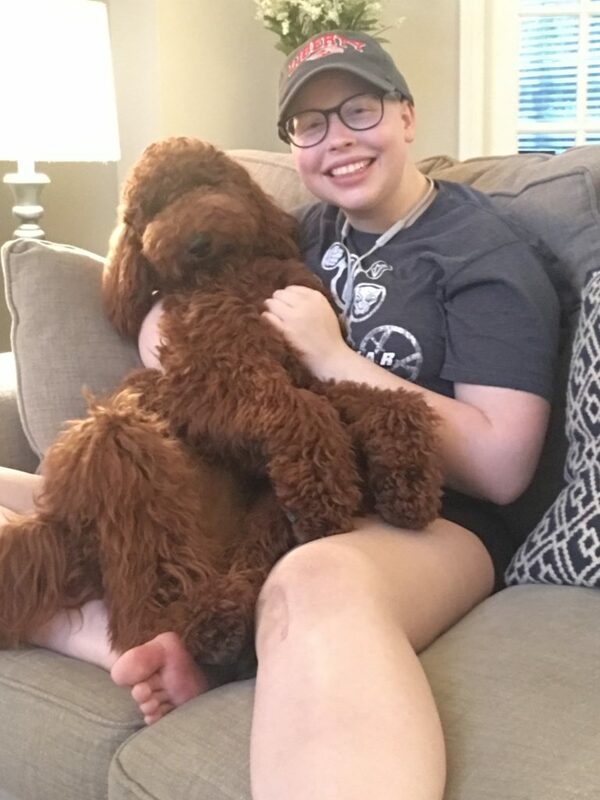 On the good side, for the last 10 or 11 days – she feels pretty good, and we now prepare for another treatment starting Tuesday, July 17. 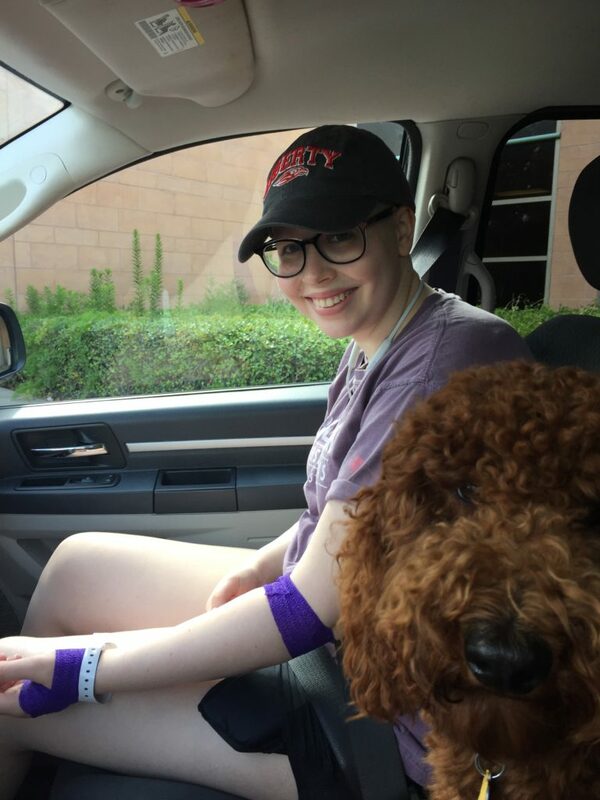 Emily went through her first outpatient doxorubicin treatment two weeks ago. She spends several hours receiving fluids through her port that are pre-meds – including meds to protect her heart (which this chemo can harm). The chemo only takes 15 minutes. Following that, she was sent home for the night and it repeated the next day. 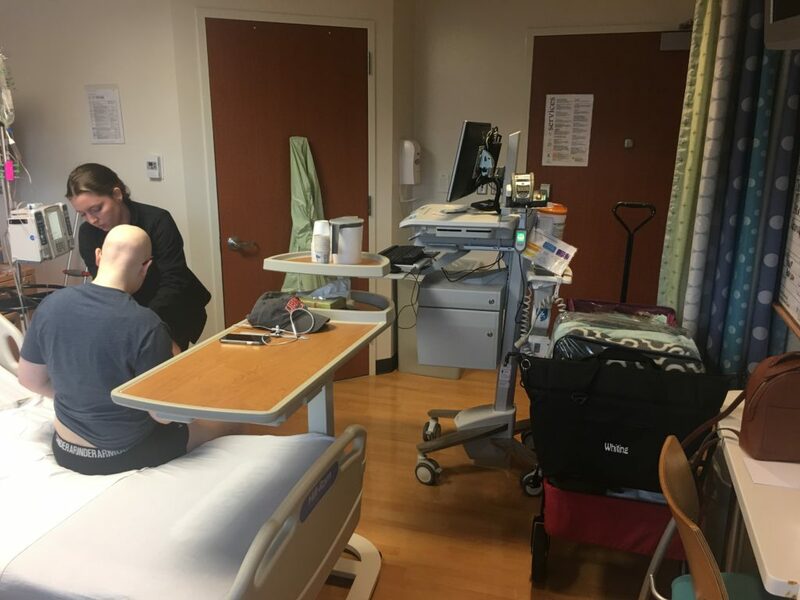 Although she didn’t feel great following those treatments, it was better than any of the other chemo rounds she has endured. We are very thankful for that. Following that, it was the two-week break she is on now. That brings us to tomorrow’s treatment. She begins a methotrexate treatment tomorrow (assuming her numbers are ok). That will be treatment #13 out of 18! 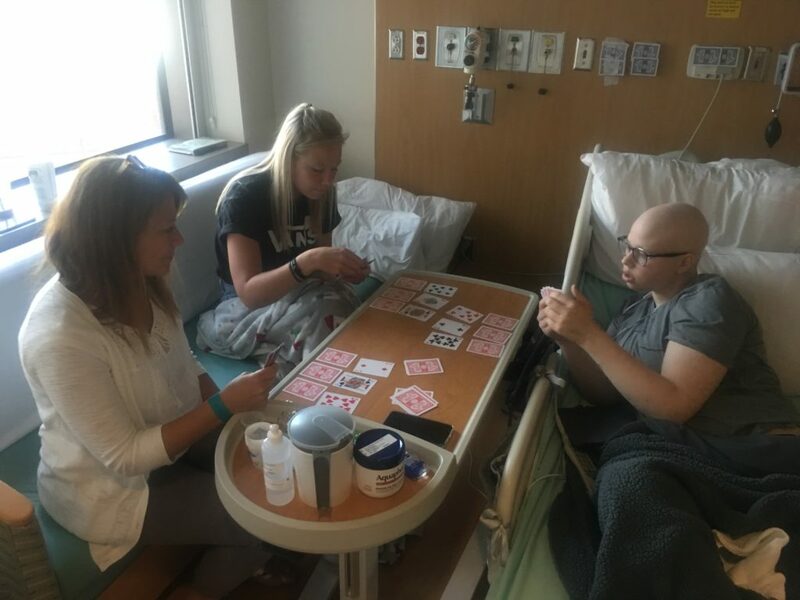 If her numbers stay strong and she stays healthy, she is scheduled to have three treatments in a row – three weeks in a row. Many have asked about the prognosis. We have been told because things have gone well, her prognosis remains at 70% chance of long-term survival. We are thankful that although Emily faced extreme mouth ulcers as a result of chemo, it was the first time she faced them to that degree. We are so thankful for that. We continue to be thankful for Emily’s joyful attitude and disposition. When she isn’t suffering, she always has a smile on her face and a cheerful spirit. We are so thankful for that. And when she is suffering, she is quiet. We’ve been thankful that when she feels the worst, she doesn’t live out her worst responses. Emily still hasn’t thrown up for the last three treatments now. We are thankful for that since throwing up is one of her least favorite things. This feels like an impossible request, but I would ask you to join us to pray that Emily would be able to go through three treatments in a row (3 weeks in a row). Frankly, she’s never been able to do three in a row. She has a two-week break after the third treatment. We feel like we will be close to the finish line if we can get through these three weeks without delay. Would you join us in praying for that? Pray for Emily’s body to stay strong. The further she has gotten into treatments, her body is weakening. Pray her blood numbers to stay high. The last two methotrexate treatments, Emly was able to go home after 4 nights, instead of the typical 5. Pray that happens again this week. It is nice to have 3 nights at home between treatments. Pray her mouth ulcers do not become overwhelming. It is normal for her to develop some minor ulcers, but we are praying to avoid what happened 3 weeks ago. Pray that Emily can restart college this fall. It looks like it will need to be online because she won’t be done by the time college starts. Please pray that Emily will be able to show that her joy and strength are from God. And that Jesus will be revealed to others through her suffering. Two or three times a week Emily has to get a blood test. She can do that locally and doesn’t have to go downtown. They test her in case her numbers are too low, they can send her to the hospital to get a transfusion or fluids. Although even on her non-chemo weeks, she has rehab down at MD Anderson 2 or 3 times a week. This was taken just before we left the hospital after her last methotrexate treatment in June. She has to get a shot in her stomach to help her white blood cell counts go up. But we were packed and ready to go. 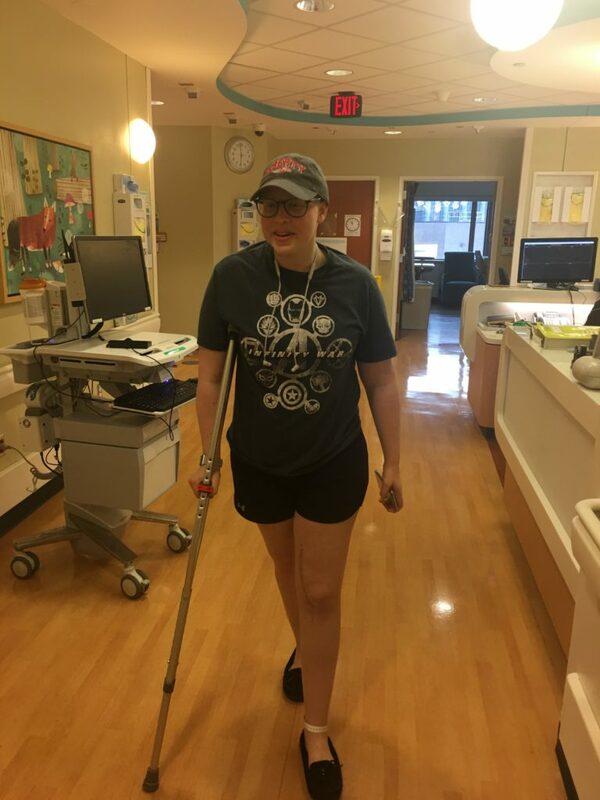 It is always great to see Emily walking through the hospital without the fulid cart attached. That means she is on her way home! Last year we began a July 4 tradition of eating garbage plates to remind us of Rochester. (For those not from Rochester, Google it – it really is a thing). 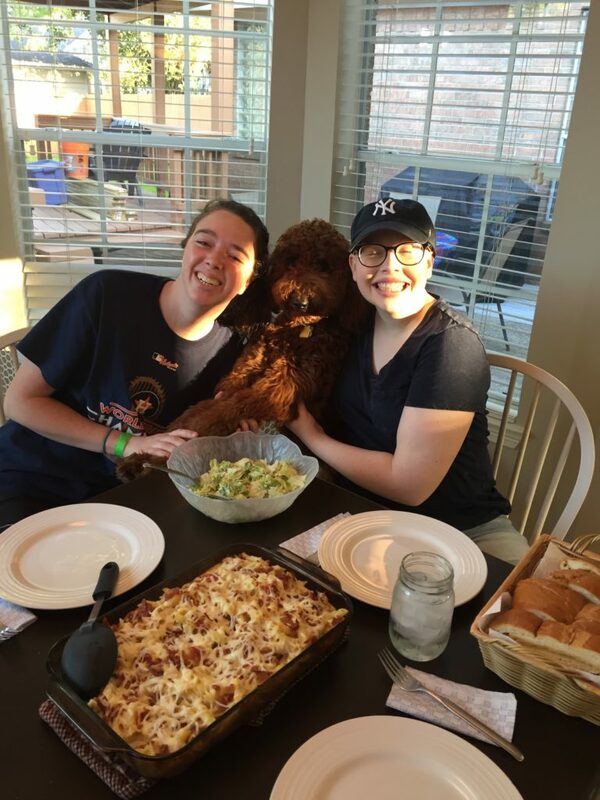 The problem was, Emily was going to have chemo on July 2-3 – so she knew she wouldn’t feel like eating on the 4th. 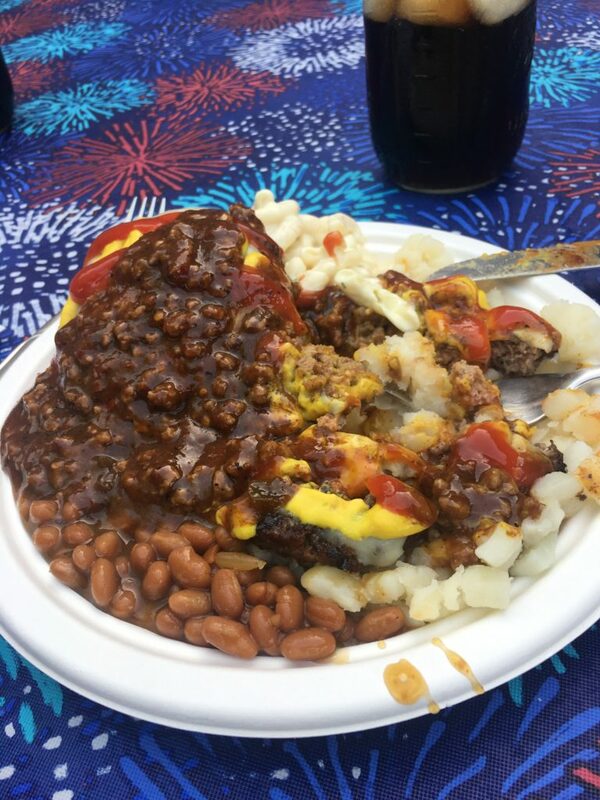 So we moved our July 4th celebration up a few days and enjoyed garbage plates at the end of June. While we wait to get discharged from her mouth ulcers (one of only two times she had hospital stays that weren’t chemo or surgery related). That is pretty good, we hear. Daisy gets a bit sad, it seems, on hospital weeks because we are all away. 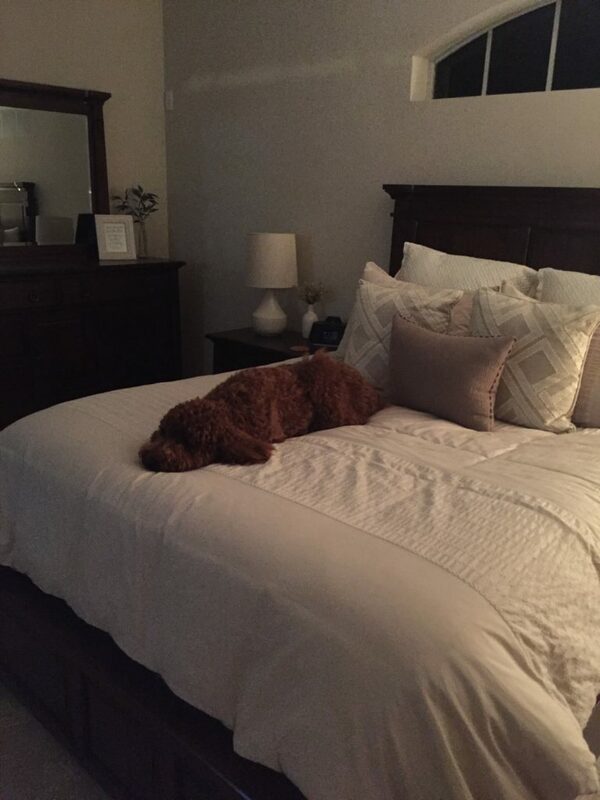 I’m still shocked Sue lets the dog on the bed. 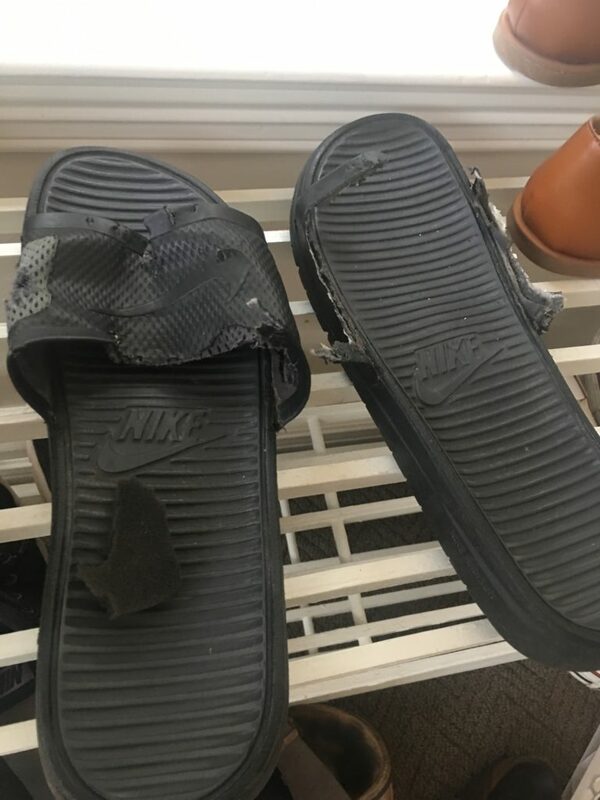 She may be everyone’s favorite in the fam, but when I came home and found my sandals like this – we had to have a chat. She gets into mischief when she’s alone for a long time. She gets very happy when we get home from a hospital stay. She’s a cuddler… and everyone takes advantage of that. 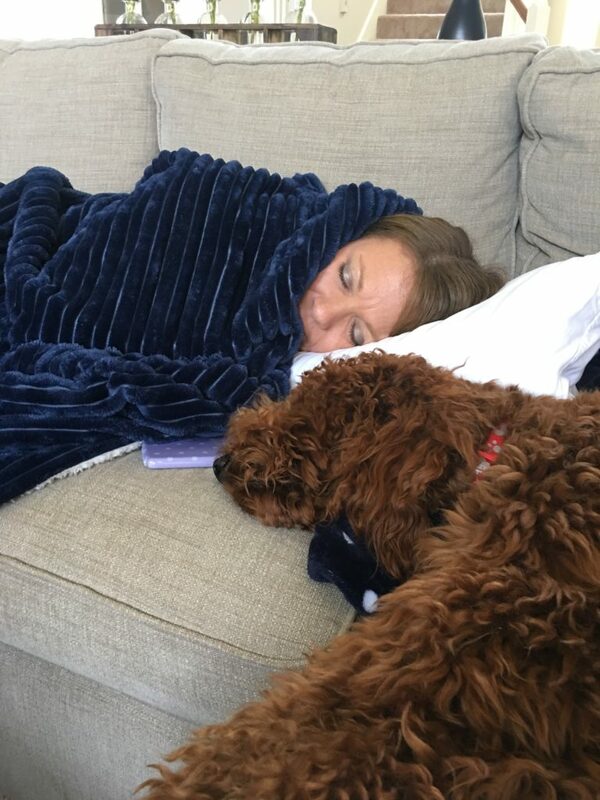 She and Sue napping after a hospital stay. Emily decided one night that she was going to make dinner. So she did. She didn’t want help from anyone else. I’m sorry I was traveling and missed it! 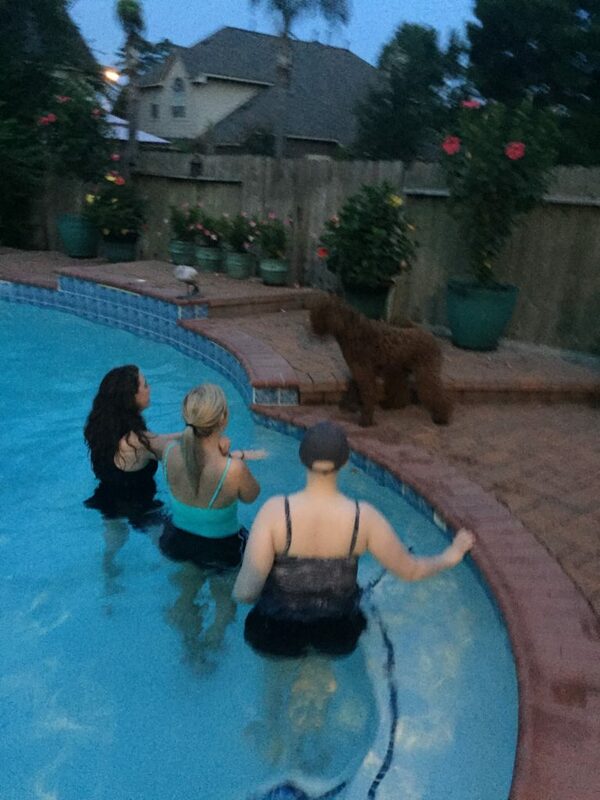 A neighbor a few doors down is away for the summer and gave us permission to use their pool. 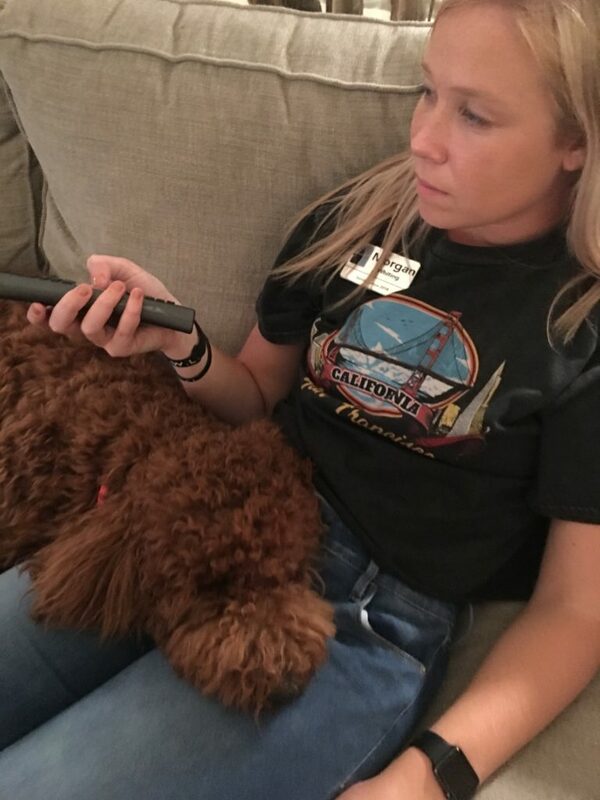 It is great for Emily’s rehab! But Daisy wants nothing to do with it. When I travel, I have been blessed with some new, great friendships. 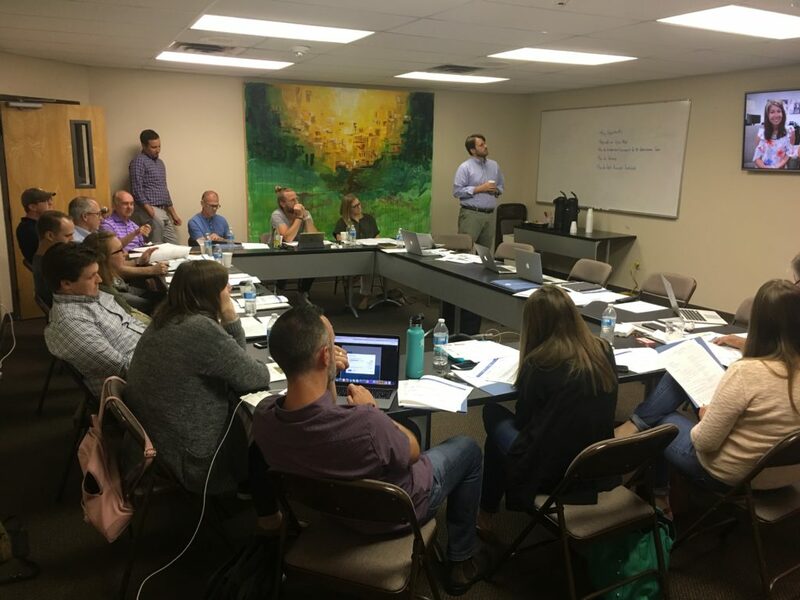 Recently I spent a couple of days back at The Village Church and enjoyed again spending time with their elders and leaders. They have been faithfully praying for Emily (along with other churches I’m able to serve). I’m so thankful for them. Recently, some old friends came into town. 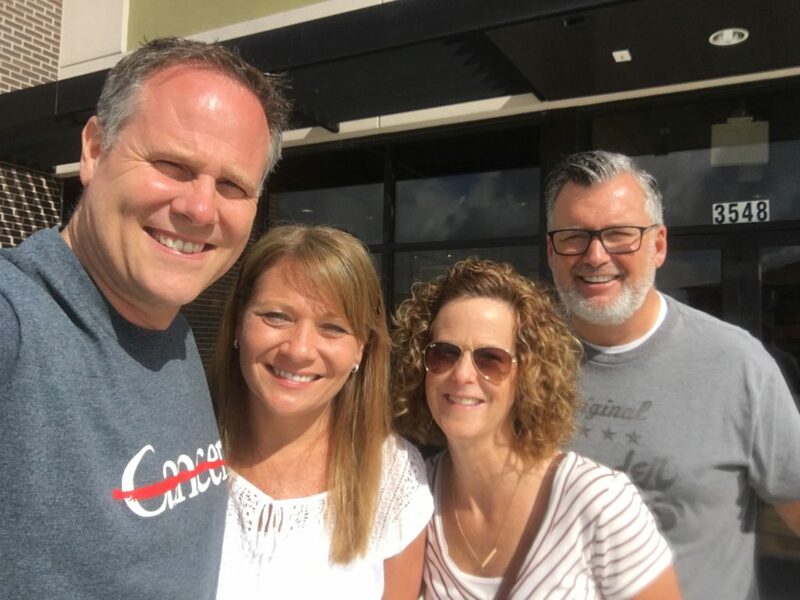 Dena & Tom Butler were in town and we were able to go to breakfast. Dena’s husband passed away from ALS several years ago. And Tom’s wife passed away from cancer a few months later. They recently were married. The time we spent with them was a great blessing for Sue and me. Thanks so much for the update. Your have such a beautiful family. Thankful Emily is almost at the end of her treatment. We this of her and your family often. David, you will always be very special to us. Much love to you and all your girls. Continuing to pray for the specific requests you outlined. Garbage plate?